MEMPHIS, TENNESSEE (December 29, 2014) Texas A&M’s freshman quarterback Kyle Allen from Scottsdale, AZ threw for 294 yards, had four touchdown passes, and scrambled for a 14 yard touchdown to lead the Aggies in a 45 – 37 victory over the West Virginia Mountaineers in the 2014 Liberty Bowl at Liberty Bowl Memorial Stadium in Memphis, Tennessee on December 29, 2014. This was the first meeting between Texas A&M and West Virginia in football. However, both schools have experience in the Liberty Bowl, which has been around since 1959. In 1964, West Virginia lost to Utah 32 – 6. In 1975, the Aggies were shut out by the USC Trojans 20 – 0. The head coaches Kevin Sumlin (Texas A&M) and Dana Holgorsen (West Virginia) worked together at the University of Houston earlier in their careers. Sumlin was the head coach for University of Houston from 2007 to 2011. In 2008 and 2009, Holgorsen was the offensive coordinator and quarterback coach. During these two years, the Cougars were ranked in the NCAA as No.3 and No.1 in total offense. This set the stage for what would be the second highest scoring Liberty Bowl game ever. In all, there were seven touchdown passes (four touchdown passes over 40 yards), two running touchdowns, an interception run back for a touchdown, four field goals, and – of course – 10 extra points made. Total offense was just over 1000 yards, the Aggies had 529 yards while the Mountaineers had 472 yards. The Aggies’ Josh Reynolds began the scoring early in the first quarter on a 44 yard touchdown reception from Allen. Malcome Kennedy had two touchdown receptions, one for 11 yards and the other for 9 yards. Trey Williams had a 40 yard touchdown reception and a running touchdown of 18 yards. Josh Lambo kicked a field goal from 26 yards out and was 6 – 6 on extra point attempts. The West Virginia Mountaineers’ quarterback Skyler Howard (Sophomore), from Ft. Worth, TX threw for 346 yards and three touchdown passes. The longest touchdown pass of the day was to Kevin White for 49 yards. Mario Alford scored on a 45 yard reception. The final touchdown pass was to Elijah Wellman for 4 yards. The Mountaineers’ defense contributed to the scoring when freshman KJ Dillon picked off an interception and ran it back for a 35 yard touchdown. Josh Lambert scored three field goals (32, 40, and 31 yards out) and was 4-4 on extra points to finish out West Virginia’s 37 points. This loss brings West Virginia’s bowl record to 14 – 19. For Texas A&M, this is the fourth straight bowl win, the best consecutive record in the school’s history. The Aggies are now 17 – 19 in bowl games. 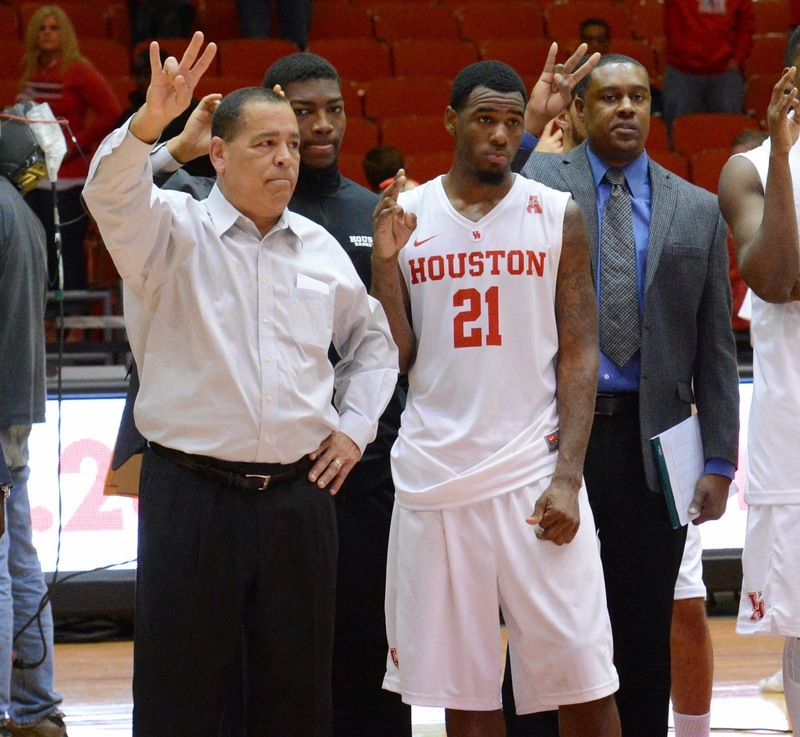 HOUSTON, TEXAS (December 28, 2014) Scoring 24 of his 28 points from three-point range, Jherrod Stiggers (shown left) led the Houston Cougars to an 80-53 win over the Mississippi Valley State Delta Devils on Sunday, Dec. 28, 2014 at Hofheinz Pavilion in Houston. Stiggers' eight three-pointers was a career high for the starting guard and helped to give the Cougars their seventh win of the season. Cavon Baker and Devonta Pollard also scored in double figures; 13 and 12 points respectively. Danrad Knowles led the Cougars with 10 rebounds, with Pollard and Stiggers each getting two steals. Pollard was perfect from the free throw line, 6-of-6, along with seven rebounds. Stiggers talked about is eight three-pointers in the post-game press conference. “It was just the flow of the game. I try to play as hard as I can, but coach says to not force shots, and just let them." Houston out-shot the Delta Devils from the field (48.1%-37.0%), free throws (78.9%-66.7%) and from three-point range (43.3%- 25.0%). They also held an advantage in second chance point (17) which was a direct result of their 16 offensive rebounds. 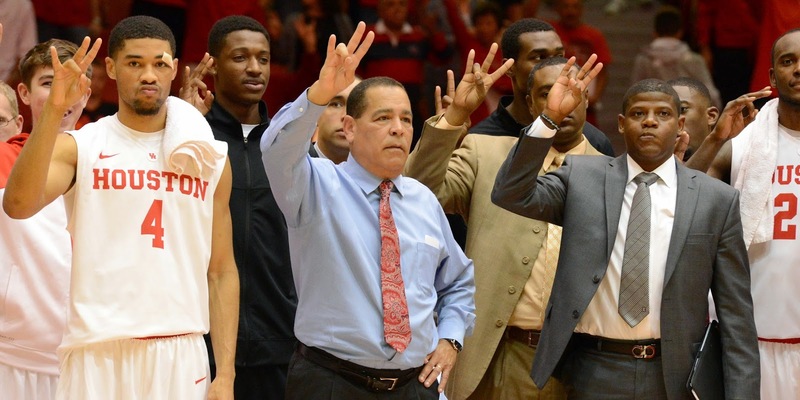 Houston head coach Kelvin Sampson spoke about the Cougars’ slow first half start with the press after the game. “Turnovers. We’re going to turn the ball over some. That’s the way we’re built. Chuck (Cavon Baker) is going to turn it over some. Jherrod (Stiggers) is going to turn it over some. Eric (Weary) is going to turn it over some. Devonta (Pollard) is going to turn it over some. We’re not a team that’s going to play a clean game. We’re just not built that way." MVSU shot 46.2% in the first half, but was held to 28.6% in the second half, The Cougars outscored the Delta Devils in the second half (40-20) by shutting down their offensive attack. MVSU only shot 8-of 28 from the field in the second half. Isaac Williams led the Delta Devils with 12 points, while Vacha Vaught pulled down nine rebounds. Houston will next head to Memphis on Dec. 31 to face the Tigers in American Athletic Conference action. From there they will travel to Oklahoma to play Tulsa on Jan. 4, 2015 before returning home to play UCF at Hofheinz Pavilion on Jan. 6. Tip-off is scheduled for 6 p.m. in Houston. EL PASO, TEXAS (December 27, 2014) It was a battle of the devils at University of Texas at El Paso’s football stadium where the Arizona State Sun Devils intercepted a game winning touchdown pass over the Duke Blue Devils with less than 45 seconds left on the clock to hold take a 36-31 win n the 81st Sun Bowl on December 27, 2014. What started out as a 20 – 3 lead early in the second quarter by ASU, ended in a thrilling back and forth game that went down to who ever made the last big play. ASU’s Freshman running back Demario Richard tied the Sun Bowl record of most touchdowns by collecting four; two on the ground and two in the air. Sun Devil field goal kicker Zane Gonzales, of Deer Park, TX, was successful on attempts from 28, 38, and 47 yards with three extra points to complete ASU’s scoring. Other notable performances for ASU include Kalan Ballage’s 96 yard kick-off return after Duke took the lead 31-30 in the 4th Quarter with 5:03 left. This set up Demario Richard’s second running touchdown to put the Sun Devils ahead for good. The final notable performance from ASU came when defensive back Kweishi Brown snatched the ball out of the air for a critical interception in the corner of the end zone with 45 seconds left on the clock. This sealed the game for the Sun Devils. Duke’s running back Shaquille Powell had over 160 yards while wide receiver Jamison Crowder, who could have been named MVP if Duke had won, had seven catches for 102 yards, 68 yard TD punt return, and a left-handed pass for a touchdown to Isaac Blakeney late in the game to put Duke ahead 31-30. For the third year in a row, a Duke bowl game is plucked from their grasp, leaving seniors empty-handed after setting all-time Duke performance records. ASU finishes 2014 with second straight 10-win season, and 28th win in three years. This bumps Arizona State's Sun Bowl record to 3-1-1.
to lead all Houston scorers. HOUSTON, TEXAS (December 27, 2014) Shooting only 30% from the floor, the Houston Cougars dropped their first conference game of the 2014-15 season with a 64-50 loss to the UCF Knights on December 27, 2014 at Hofheinz Pavilion in Houston. With the loss, the Cougars drop to 5-6 for the season and 0-1 in American Athletic Conference play. It was a hard road to hoe for the Cougars, shooting only 31% from the field. Houston had been averaging 36.4% in their previous 12 games, in addition to pulling down an average of 35.9 rebounds per game. Against the Knights, the Cougars pulled down their second lowest number of rebounds in a game this season (29). Forward Marche’ Amerson led the Cougars with 10 points; six of them from three-pointers, along with a season high three steals. Forward Tyler Gilbert tallies eight rebounds and guard Alecia Smith had a career high of seven assists. Houston team took a 29-26 lead into the locker room at halftime, however UCF came out in the second half and took command of the court. They outscored Houston 38-21 and took the lead with 10:41 remaining in the game. Capping off 13 unanswered points, along with five straight scoring shots gave the Knights a 43-35 lead. From that point, the game was all UCF. 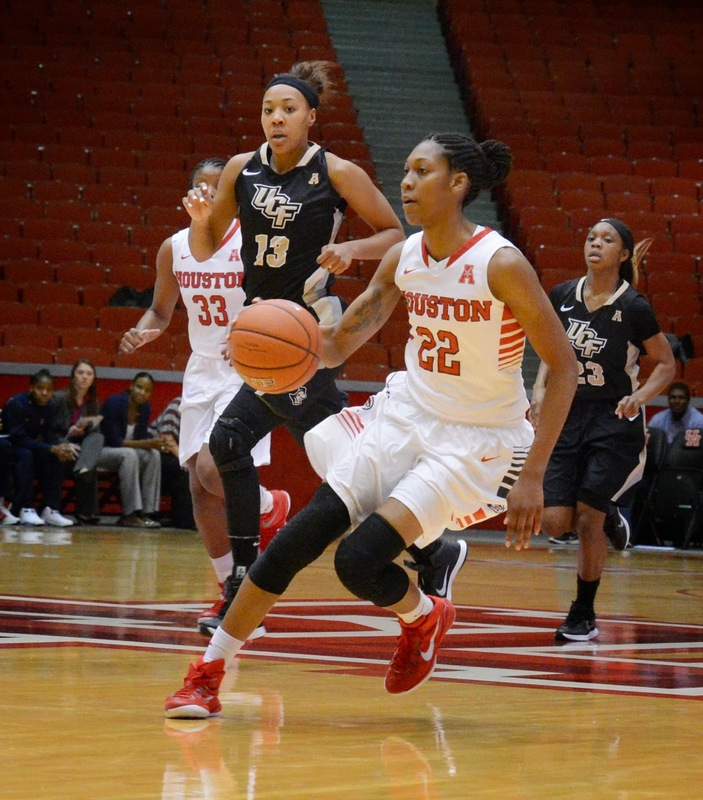 UCF commanded the boards, out-rebounding Houston 55-27, pulling down 18 on the offensive end of the court which resulted in 23 second chance points. They also led Houston in points in the paint, 34-24 and bench points 26-18. Houston’s next test will be on Sec. 30, 2014 in an 11 a.m. game versus Tulane in New Orleans. Hughley also commented in the press conference on the Cougars’ next opponent. HONOLULU, HAWAII (December 24, 2014) The Rice Owls’ offense soars past the Fresno State Bulldogs while the defense keeps the Bulldogs caged for a controlling 30 – 6 victory at Aloha Stadium in the 2014 Hawai’i Bowl on December 24, 2014. The Owls’ junior quarterback Driphus Jackson, who was selected the Player of the Game, led the offense with 318 yards passing and three touchdowns. Dennis Parks caught five passes for 109 yards and a touchdown, while Mario Hull and Jordon Taylor scored the other two passing TDs’. After a 58 yard screen to sophomore running back DarikDillard from San Antonio, TX, Dillard punches it in for a one yard touchdown. Rice’s senior kicker James Hairston completed the scoring by connecting with a 21 yard field goal in the first quarter and three extra-points. The Owls’ defense closed down the Bulldogs by blocking field goals, catching interceptions, and allowing only 93 yards passing. Before this matchup, Fresno State and Rice have met six times with the Bulldogs leading the series 6 – 0. This is the second time Fresno State has played in the Hawaii Bowl in three years. Two years ago, the Bulldogs lost to the SMU Mustangs 43 – 10. The Owls have been in three consecutive bowl games, winning twice. Their bowl record going back to 1938 is now 7 – 5. LAS VEGAS, NEVADA (December 24, 2014) Boosted by junior guard Jherrod Stiggers (#21 shown right) scoring 26-points from the field, the Houston Cougars ended an eight game losing streak to Texas Tech by downing the Red Raiders 82-69 in the Continental Tire Las Vegas Classic on Tuesday, Dec. 23, 2014. The last time the Cougars defeated the Red Raiders was Feb. 12, 1994 in a 76-64 win at Hofheinz Pavilion. The 6-4 junior from Terrell, Texas shot 8-of-12 from the field, including 7-of-9 from three-point range. It was third 20-plus point game of the season and the sixth of his career. He also was 2-of-4 from the free throw line and pulled down seven rebounds. Houston took a 41-34 lead into the locker room at halftime and lead by 17 points at the 6:05 mark in the first half. The Red Raiders made it interesting, cutting the Cougar lead to one point with 1:37 gone in the second half on a three-pointer by Toddrick Gotcher. After that, Texas Tech never got closer than four points. Prior to the game, Houston was averaging 39.0% in shooting from the field. Against the Red Raiders, they shot 27-of-50 for 54.0% and 13-of-24 (54.2%) from three-point range. Coming off the bench, Eric Weary, Jr. pulled down a team high nine rebounds, eight of them of defense, in addition to scoring 11 points. L.J. Rose added 16 points to the Cougars’ offensive effort, while Devonta Pollard added 12. For the Red Raiders, Devaughtah Williams scored 21 points, while Randy Onwuasor added 14. The Cougars raised their record to 6-4 for season and will next face Mississippi Valley State on Dec. 28 with a 4 p.m. tipoff at Hofheinz Pavilion. 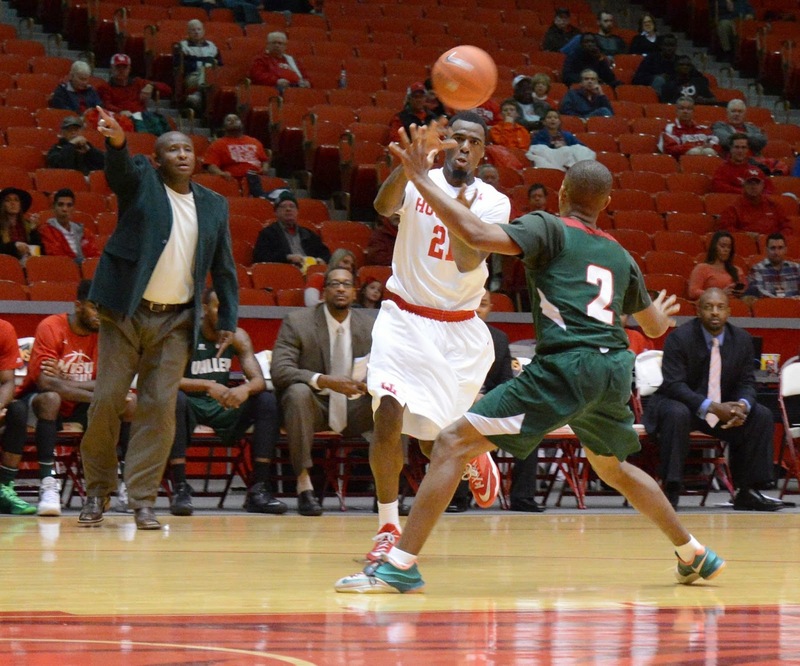 Houston is 2-0 against Delta Devils, having downed them 92-58 on Dec. 13, 2008 and 78-69 on Dec. 5, 1986. LAS VEGAS, NEVEDA (December 22, 2014) Fighting back from a nine point deficit at the half to tie the game at the end of regulation, the Houston Cougars came up two points short in overtime; falling to the Boise State Bronco by the score of 75-73 on Monday, Dec. 22, 2014 in the championship round of the Continental Tire Las Vegas Classic at Orleans Arena in Las Vegas. The loss is the Cougars’ third straight and dropped their record to 5-4. The Broncos raised their record to 10-2. Houston will face Texas Tech on Tuesday, Dec. 23 for third place in the tournament. The Broncos had a 19 point lead at the 17:28 mark in the second half. The Cougars battled back to tie the game at 62-all in regulation to force the game into overtime. After a spirited and intense overtime period, Boise State edged out a two point lead in the final seconds for the win. Danrad Knowles again led the Cougars on the court for his second double-double in as many games. The 6-10 sophomore, who played his prep ball at HCYA in Houston, scored 15 points and pulled down 12 rebounds, 10 of them on defense. L.J. Rose, who saw 42 minutes of playing time, scored 16 points, with six of those points coming at the free throw line. Three other Houston players scored in double figures; including Devonta Pollard with 12 points, followed by Jherrod Stiggers with 11. Starting guard LeRon Barnes contributed 10 points, along with 2-of-4 from three-point range. Houston shot a paltry 36.9% from the field, along with 25% from three point range. They also tallied 11 assists along with four steals. Boise State had five players scoring in double digits and shot 47% from the field. They were also 42% from three-point range. HOUSTON, TEXAS (December 22, 2014) With a new quarterback at the helm, the Houston Texans upset the Baltimore Ravens by the score of 25-13 at NRG Stadium in Houston on Sunday, Dec. 21, 2014. With the wins, the Texans raised their season record to 8-7 and remain in the hunt for a wild-card playoff berth. Leading the Texans on the field was former University of Houston and Houston Texans quarterback Case Keenum. Prior to this week, Keenum was on the practice squad of the St. Louis Rams. He was released from the Texans on August 31, 2104 and was picked up on waivers the next day by the Rams. On Dec. 15, 2014, he was acquired from the Rams and was announced as the starting quarterback late Saturday evening (Dec. 20). The Texans have used four quarterbacks in 2014. Keenum, who started preparing for the game on Monday, Dec. 15, completed 20-of-42 passes for 185 yards. He also rushed for 19 yards on four carries. The win was the first for Keenum, who was 0-8 in 2013 when he started the second half of the season for the Texans. Andre Johnson caught six passes from Keenum for 65 yards, while Arian Foster carried the ball 25 times for 96 yards. J.J. Watt led the defense with eight tackles, seven of them solo, along with one sack. With one game to go in the regular season, the Texans will begin to prepare for the 3-12 Jacksonville Jaguars, which they will play on Dec. 28 with a 12 noon CST kickoff at NRG Stadium. The Texans are currently in 2nd place in the AFC South, behind the 9-4-1 Cincinnati Bengals, who play Denver on Monday night, Dec. 22 at Paul Brown Stadium in Cincinnati. RIVERSIDE, CALIFORNIA (December 20, 2014) Despite have four players scoring in double figures, the Houston Baptist University Huskies could not hold off the offensive punch of UC Riverside and fell to the Highlanders by the score of 78-67 at SRC Arena in Riverside, CA on Dec. 20, 2014. With the loss the Huskies fell to 4-5 for the season. Guard Anthony Odunsi led HBU with 17 points, followed by Marcel Smith with 14 and Colter Lasher and Tyler Russell with 12 each. Josh Ibarra came off the bench to lead the team in rebounds, pulling down 10 in 21 minutes of play. The Huskies shot 38.6% from the field including 6-of-13 from three point range. Smith, who started at guard for HBU, scored three of three-pointers on five attempts. Rebounds were a problem for the Huskies; pulling down only 28 in opposition to 47 for the Highlanders. Taylor Johns had 17 rebounds for UC-Riverside in addition to scoring 28 points. The Huskies will have 10 days off before returning to action on Dec. 30 at Sharp Gym against Ecclesia College. Tip-off is set for 7 p.m. CST. HOUSTON, TEXAS (December 19, 2014) Senior Shanice Steenholdt connected for 24 points to lead the Houston Baptist Huskies to a 69-49 win over the McMurry Warhawks in women's college basketball action at Sharp Gym on Friday, Dec. 19, 2014 in Houston. The 6-0 forward from Roswell N.M. shot 10-of 15 from the field and was 4-of-5 from the free throw line. Heidi Sihvola contributed 19 points from the bench in the Huskies fifth win of the season. Forward Anna Strickland was active under the basket with 10 rebounds; nine of them on the defensive end of the court. The Huskies were never really challenged with the 1-12 Warhawks shooting only 31.3% from the field, along with 26 rebounds as a team. McMurry had three players in double figures; Haley Welch with 12 points, with Adijatu Disu and Taylor Russell each scoring 11. The Huskies will now have a break until their next game against Huston-Tillotson on Sunday, Dec. 28, 2014. Tip off is set for 2 p.m. at Sharp Gym on the HBU campus. 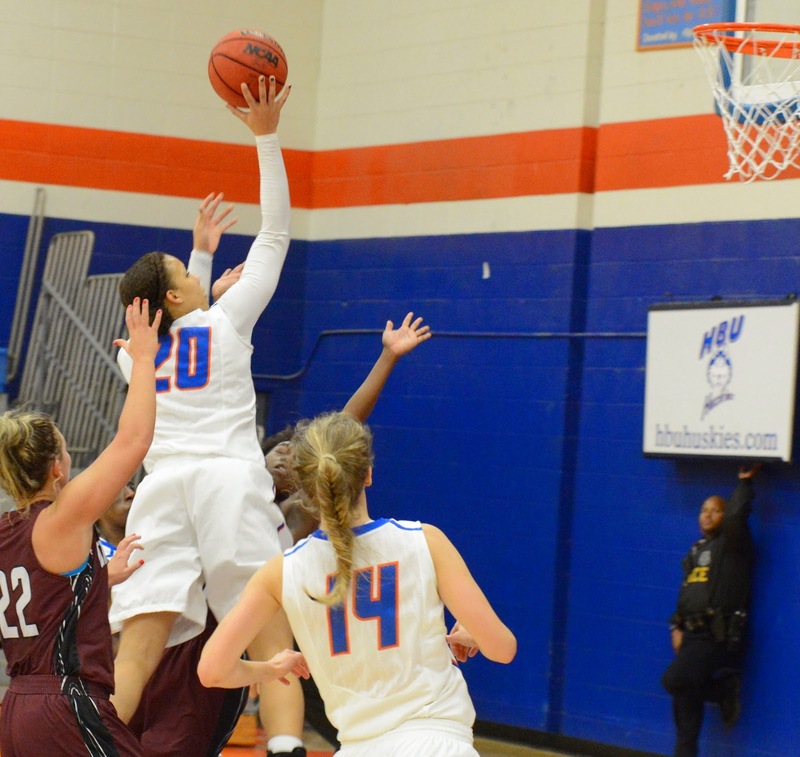 HOUSTON, TEXAS (December 13, 2014) HBU women’s basketball shot 60 percent from the floor, outscored visiting Arlington Baptist, 64-22, in the paint, and out-rebounded the Patriots, 49-18, en route to a 92-62 victory Saturday afternoon at Sharp Gym. Junior post Ashleigh Nwanguma recorded her first double-double of the season for HBU (4-3), and the second of her career, as she had season highs of 14 points and 11 rebounds in 16 minutes. 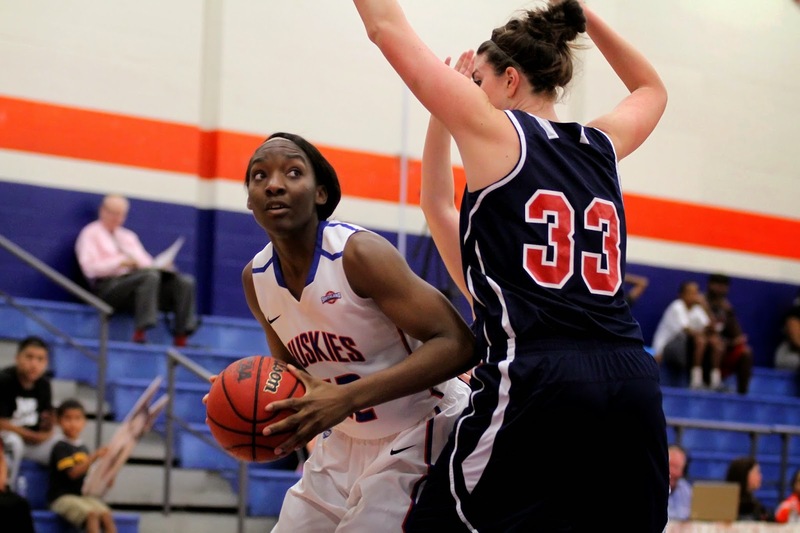 Senior forward Shanice Steenholdt led the Huskies with 22 points on 8-of-11 shooting in 19 minutes. Senior forward Erin McGarrachan tied her season high of 12 points, while Heidi Sihvola dropped 11. Jade Johnson led ABC (6-2) with 15 points, shooting 5-of-9 from the floor and a perfect 3-of-3 from the free throw line. Morgan Hale and Tori Wise each scored 12 for the Patriots. HBU jumped out to an 8-0 lead before the Patriots got on the scoreboard with a made free throw by Johnson. HBU outscored the Patriots, 21-8, in a span of eight minutes to lead by 20, 29-9, with 9:52 remaining in the first half. HBU led by as many as 23 before the Patriots used a 14-5 run to cut the deficit to 14, 39-25, following a steal and layup by Ainsley Richardson at the 3:12-mark. A steal by Tayler Jefferson resulted in a Steenholdt layup to give HBU an 18-point advantage, 47-29, with just over a minute to go in the opening half. But Wise forced a steal and it resulted in a three-pointer by Hale, as HBU eventually led ABC at the break, 49-34. Steenholdt led all players with 16 first-half points, while Nwanguma came off the bench to score 10 points and pull down a half-high nine rebounds. HBU shot 59 percent from the floor. Hale led ABC with 10 points, as the Patriots shot 39 percent from the floor. The Huskies began the first five minutes of the second half outscoring the Patriots, 17-9, to bring their lead back to 23, 66-43. HBU continued to put the pedal to the metal, as they increased their lead to the 30s. At the 5:11-mark, freshman Carissa Diaz scored her first collegiate basket in Sharp Gym, giving HBU an 86-56 lead. Erin McGarrachan led HBU with 10 second-half points, while Jefferson had seven points, three assists, two rebounds, and two steals. HBU shot 61 percent from the floor in the half. The Patriots were led by Johnson with six points. Prior to the game, Steenholdt was awarded a commemorative ball, honoring her 1,500th career point she earned at UT-Pan American Nov. 29. She is the program's all-time NCAA Division I leading scorer. 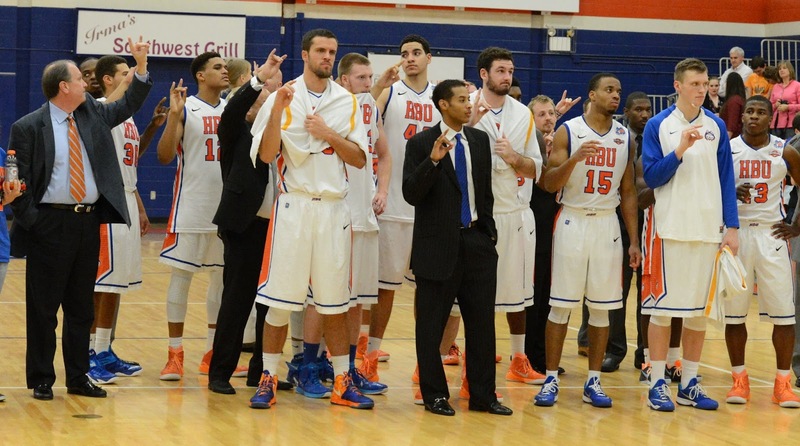 HBU hosts cross-town rival Texas Southern Wednesday, Dec. 17 at 6 pm. HOUSTON, TEXAS (December 14, 2014) The Katy Tigers scored a single touchdown and extra point in overtime and as a result, downed the Cibolo Steele Knights by the score of 27-20 at NRG Stadium in Houston. With the win, the Tigers advanced to the UIL Division II-6A championship game next Saturday, Dec. 20, at AT&T Stadium in Arlington. 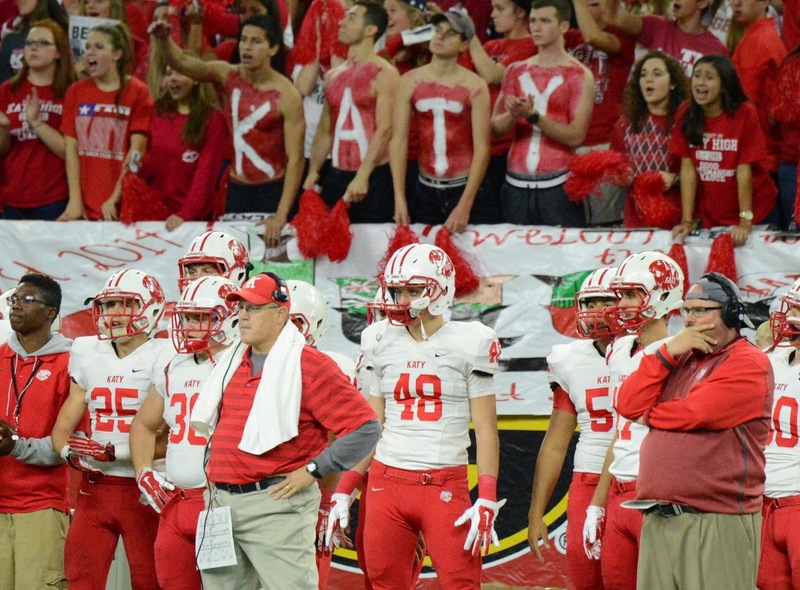 Katy will face Cedar Hill in the title game for the third year in a row. The Longhorns punched their ticket to the title game by overwhelming Spring Westfield 64-33. Steele kept the game close and tied the score at 20-all late in the fourth quarter, forcing the game into overtime. Rodney Anderson scored the game-winning touchdown on a eight-yard romp and kicker Kris Perez added the extra point for the win. Perez put the first of Katy’s points on the scoreboard at the 8:46 mark in the first quarter with a 45-yard field goal. Kyle Williams pulled down a Garrett Dolan 10-yard pass for the first touchdown of the game. Perez’s PAT gave Katy an early 10-0 lead. The Knights responded with their our score with 3:56 left in the first quarter on a seven-yard run by Bryson Denley and a Caleb James kick. Katy came back in the second quarter with another touchdown on a 13-yard pass from Dolan to Garrett Dorion to close out the half and take a 17-7 lead into the locker room. "I knew it had a chance to be a close game, but credit them. How many times are we going to turn the ball over? Every time we've done that, we've struggled. We just can't do that, but to be able to win after you do it is a great thing for us and for our kids." Steele came back in the second half and scored 13 unanswered points to give the Knights a 20-17. The Tigers responded with a 25-yard field goal late in the fourth quarter to tie the game and send it to overtime. Katy will be making their 13th trip to the state championship game. They have won the state title seven times. Division I Volleyball All-American second team. public relations, and government affairs department. ﻿PASADENA, TEXAS (December 10, 2014) San Jacinto College sophomore Ana Helena Ribeiro has been named to the National Junior College Athletic Association (NJCAA) Division I All-American second team, the organization announced this week. “Ana is a fantastic player and young lady,” who just completed her 13th year at the helm of the San Jacinto College volleyball program. “She has so many attributes for a life of success. She has perfected the art of balancing her academics with her athletic endeavors. Not only has she earned All-American honors two years in a row, but she will also earn academic honors later this Spring. She is a valuable asset to any program. To be recognized twice, nationally, for this award, is very well deserved. We are incredibly proud of her." Ribeiro (Villa Nova de Gaia, Portugal / Escola Secundária António Sérgio), a middle blocker, averaged 12.15 kills and 0.72 blocks per set, while hitting .294, this season. She was third on the squad in total blocks with 44. Ribeiro finished the year ranked as the second best student-athlete in the Region’s South Zone, and was named to the Region XIV all-conference first team. 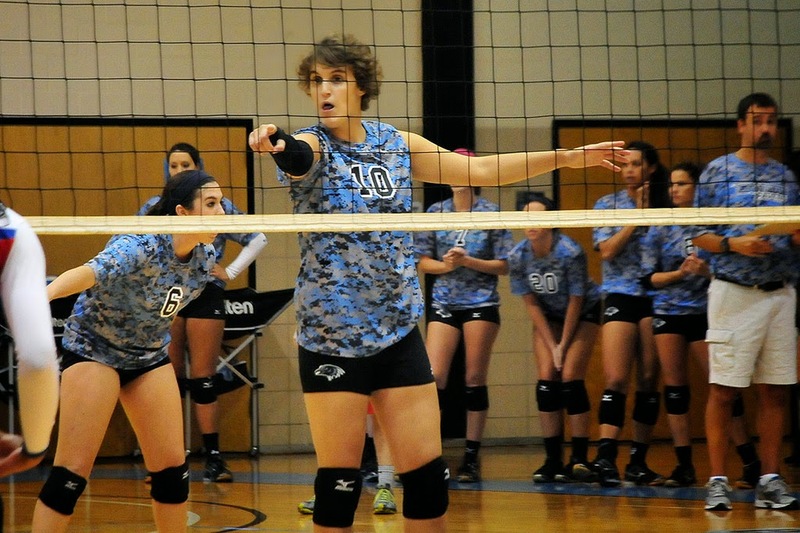 For a complete list of the NJCAA Division I Volleyball All-Americans, visit the NJCAA website. San Jacinto College finished the regular season ranked 13th in the country with a 21-13 overall record.